When researching the best carpet cleaners for a home, it helps to check out some of the top brands, and Bissell has a proven track record for high performance. 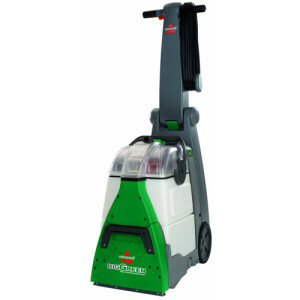 Bissell is known in part for its heavy duty professional grade carpet cleaners, and the Big Green Deep Cleaning Machine stands out above all the rest with a near perfect 5-star average customer rating. 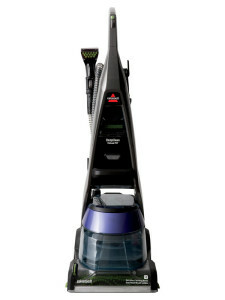 Compared to other brands such as Hoover, Bissell is known for its variety of carpet cleaning products, from specialty pet cleaners to extra high-powered professional grade carpet cleaners, like its keystone Big Green Deep Cleaning Machine , as well as its larger assortment of handheld canister spot cleaners. 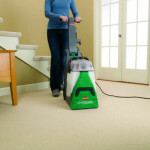 On this page we review and compare some of the best products they have to offer in 2019 in order to help you choose the right Bissell carpet cleaner for you. 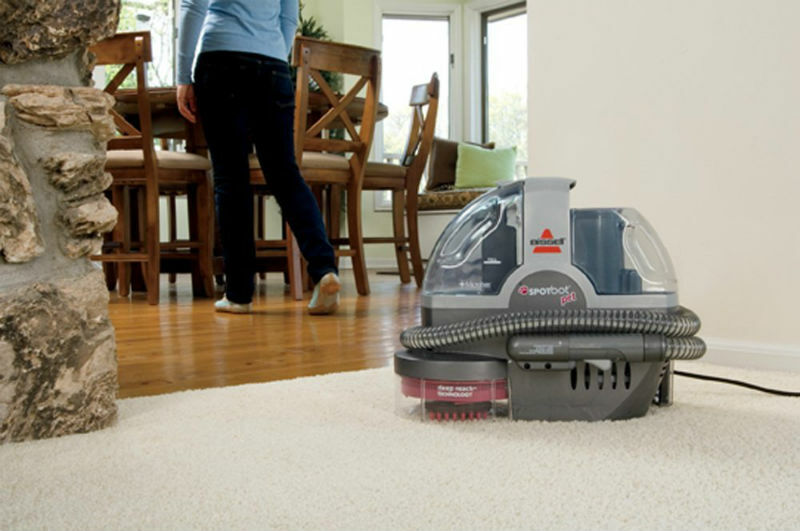 In addition to the Bissell carpet cleaner reviews, we provide a side by side comparison of some of the best Bissell carpet cleaners, so you can quickly find key information on their best cleaners. 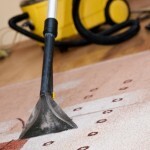 We hope this page assists you in finding the right carpet cleaner for your home. 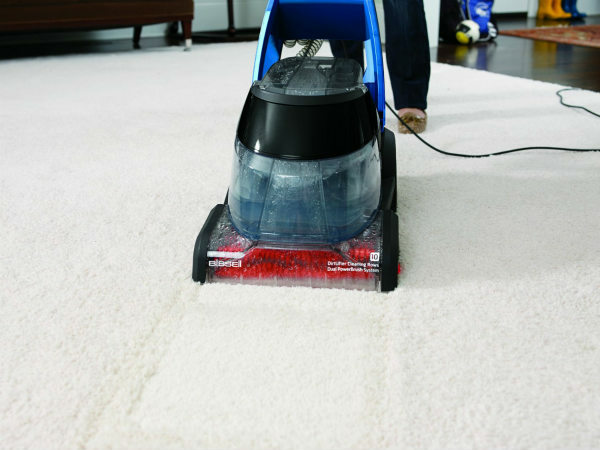 There are several different types of Bissell carpet cleaners, ranging from pet spot stain removers to deep cleaning steam styles that remove the dirt and allergens from the bottom of the carpet and the fibers. Find key statistics about each one of them in our comparison table below. One of the best Bissell carpet cleaners is the ProHeat 2X Premier 47A23 model, consistently given some of Bissell’s highest reviews for any model. 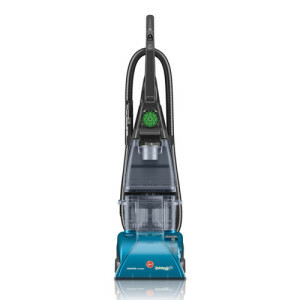 The 47A23 model features Bissell’s Heatwave Technology that constantly heats the water used to extract the dirt and germs from the carpets, maintaining the same temperature throughout your cleaning. The brush system has 10 rows of power brushes that loosen the dirt easily and lift it with the dirty water to be suctioned up and kept in a separate tank from the clean water. This model has a seven amp motor that is powered by a twenty-two foot electric cord. Positive customer reviews have indicated that this is enough power and cord length to get the job done well, and that the ProHeat 2X Premier even works well on pet stains. However, it’s best to use cold water on pet stains, as hot water will set the pet stains into the carpet more easily, and the ProHeat 2X is constantly heating the clean water tank so I would likely use a different Bissell carpet cleaner with pets in the house. 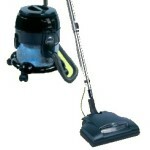 It is however suitable for cleaning upholstery, carpet, bare floors, automobile seats and floors and stairs. The ProHeat 2X Premier 47A23 is terrific with all of them and will clean a twelve inch path. 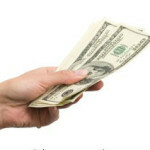 Several tools and accessories are also included, along with a three year warranty. 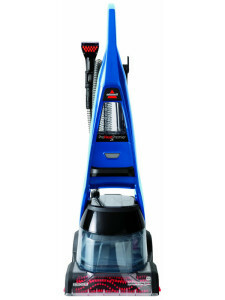 The Bissell DeepClean Deluxe 36Z9 is a very popular model for pet owners, as it looks a lot like the popular ProHeat 2X but has a number of features that are designed specifically for cleaning up after pets. 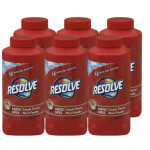 It’s Cleanshot Trigger feature lets you target the stain removal formula directly at the pet stains for extra cleaning. There is a Pet Hair Basket that traps the pet hair as its being sucked up, making it easy to dispose of all at once and keeping it separate from the dirty water tank. 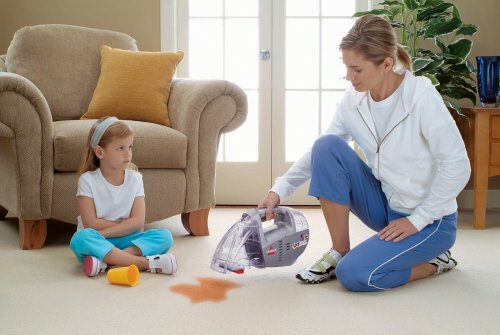 There is also a Stain Trapper tool that comes with the carpet cleaner that allows you to clean up extra gross pet messes without it contaminating the rest of your machine. It’s a separate wand tool that has it’s own container that isolates the mess and allows you to dispose of it separately. The Bissell Deep Clean Deluxe comes with dual extra large 1.25 gallon water tanks, that keep the dirty water and clean water separate. This does add considerably to the weight of the machine when those water tanks are full though. In addition, some customers don’t like Bissell’s design of combining the dirty water tank and clean water tank to the same piece, essentially making it so you can’t dump the dirty water without also dumping any clean water you may have remaining. But these negatives are not enough to dissuade customers from purchasing and being very happy with this Bissell carpet cleaner for their pets. 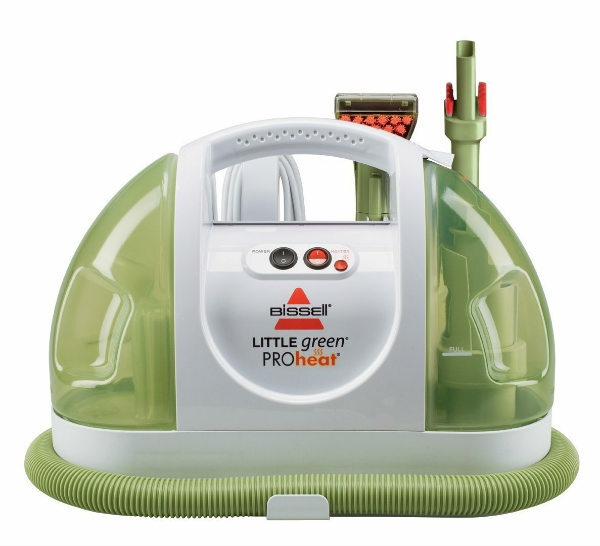 Bissell does have a similar and slightly cheaper pet cleaner model called the DeepClean Premier Pet Carpet Cleaner 17N4 , but besides it’s “Premier” name, the Deluxe one is actually a better and higher-rated pet cleaner. The Premier 17N4 also does not come with the Stain Trapper tool that helps you isolate extra messy stains, so we recommend going with the Deluxe 36Z9 model. 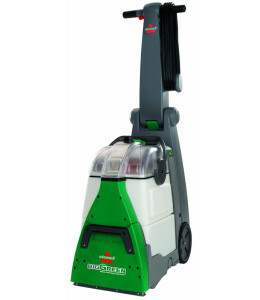 Fortunately, if you are just looking for a basic carpet cleaner that won’t cost much money but will still do a fantastically adequate job of cleaning your carpets, Bissell has some great options that are down close to $100, including the highly-rated Bissell Powerlifter that is often available now for only $99. The Bissell Powerlifter has a similar look to the older model Bissell Quick Steamer Multisurface 2090, and is essentially their updated version of it. 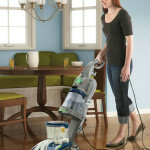 It’s popular in part because of its lightweight size and ease of movement while cleaning. 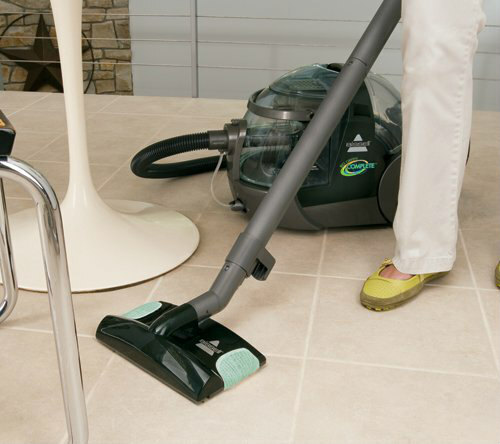 A mere twenty pounds in weight, the Quick Steamer is a perfect affordable option for deep cleaning rug areas, carpets and bare floors. The Powerlifter comes in so cheap in part because it does not heat the water. As a result, it is important to use very hot water from the tap when using this model, if you want your carpet to be cleaned with hot water. There are just 4 rows of powerbrushes in this model that loosen the dirt in the carpet to allow it to be lifted away more easily as you clean. 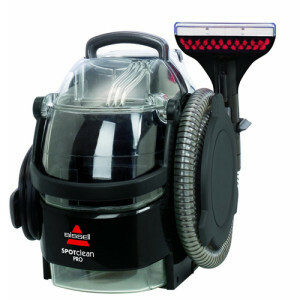 The tank capacity of the Quick Steamer is 0.75 gallon and the cleaning path is nine inches, making it a smaller fit than Bissell’s other carpet cleaners, which may help you get to some hard to reach areas without having to move so much furniture around. The power cord gives the user twenty feet of movement, without having to unplug it to find a different power outlet. 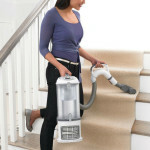 The Bissell Company is very well known in both the United States and the United Kingdom. It was founded in 1876, by Melville and Anna Bissell who owned a small shop selling crockery and china in Grand Rapids, Michigan. The fine shavings of sawdust that the crockery was packed in were difficult to sweep up off the shop’s carpet, so Melville invented a new unique type of carpet sweeper to solve the problem. 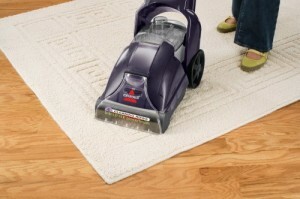 Bissell became famous for having the best cleaner for carpets. When Melville died, Anna took over the management of the company, becoming the first female CEO in the United States. Today the company is still family owned, now in the fourth generation. The first store in London subsequently opened, with public demonstrations of the Bissell carpet cleaner, and shortly thereafter Bissell appeared as standard cleaning equipment in the palace of Queen Victoria. 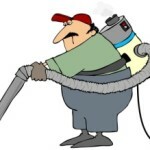 It was the beginning of the demand for the carpet cleaners in all corners of the United Kingdom as many home owners wanted to own the same type that was used inside the palaces. 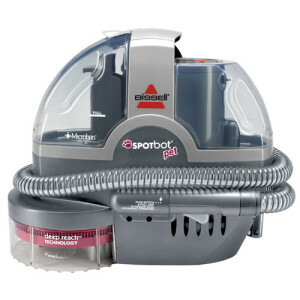 In the early 2000s Bissell moved deliberately into the pet space and today they produce models and solutions specifically designed to help pet owners clean up pet hairs and stains. As a result, a Bissell carpet cleaner is typically the best choice for many pet owners. 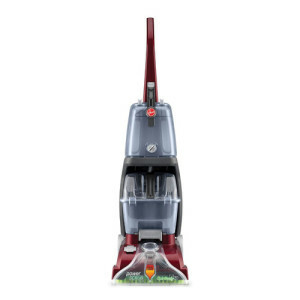 The Bissell company has a proven track record for producing high quality machines that work very well under different situations and with various types of cleaning utensils enabling them to be valued among the best deep cleaning carpet machines available for home use. The Bissell website can be helpful when researching further and selecting the right carpet cleaning machines that are best for you to use in keeping your home safe from dirt and germs that can be counterproductive to your family’s health and happiness. 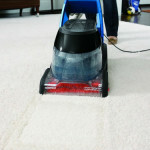 Or take a look below for some of our detailed reviews on individual Bissell carpet cleaners.